Give Back for Special Equestrians provides scholarships for therapeutic horseback riding and equine assisted therapy for children and veterans with physical and emotional disabilities, while also nurturing young equestrians in the value of giving back. We have two main programs: 1. 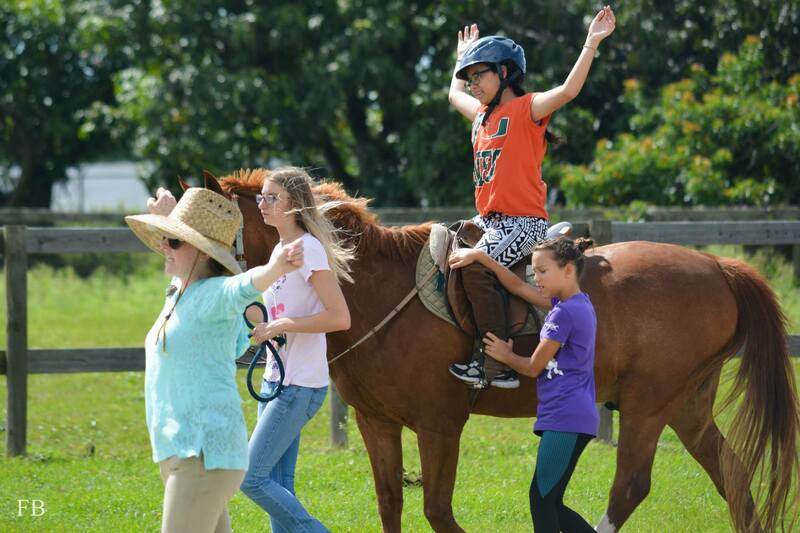 We raise money for our partner Stable Good Hope Equestrian Center in Miami, FL so that they can continue to offer low cost or free services to those with disabilities like Autism, Cerebral Palsy, Intellectual Disabilities, TBIs, PTSD, and many others. 2. We also provide opportunities for young riders to get involved in philanthropy and giving back by having them involved in fundraising efforts as well as volunteering at Good Hope and helping with therapeutic riding lessons. On of our first volunteer days at our partner farm - Good Hope Equestrian Center. Our young ambassadors help lead horses, support riders with different disabilities, and help with prep work or clean up after lessons. Our team along with several riders and staff from Good Hope Equestrian Center as we had the opportunity to preset the with a $10,000 check. One picture from our volunteer day and our Young ambassadors at work at Good Hope Equestrian Center in Miami.. The Give Back for Special Equestrians president and Vice president, Sissy DeMaria-Koehne and Dr. Heather Kuhl, over see the Young Ambassadors as they volunteer their time at South Beach's Longines Show jumping. Aside from volunteering thier time to help in anyway the event staff requested, the Young Ambassadors sold programs and all proceeds went to provide riding scholarships to those in need. The primary program of Give Back for Special Equestrians is to raise money to provide yearly scholarships for children and veterans with physical, emotional, and developmental disabilities. Through our fundraising we are able to provide scholarships to children and veterans with Autism, Cerebral Palsy, Traumatic Brain Injuries, developmental delays, PTSD, among other physical and emotional disabilities. Equine Assisted therapy is incredibly powerful for those described above, however, it can be expensive to for this life changing therapy. Give Back for Special Equestrians believe equine therapy should be accessible to all children or veterans who need it. 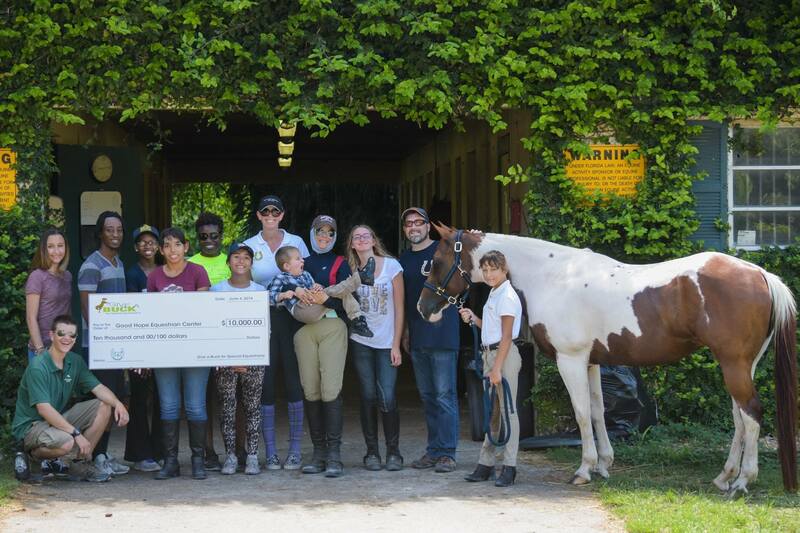 We provide riding scholarships to our partner farm in Miami, Good Hope Equestrian Center and they serve riders in the Miami-Dade County at this location..
Our secondary program is to encourage young riders (ages 8-25) to get involved in philanthropy and giving back through our young ambassadors (YA) program. Our YAs volunteer at our partner farms and participate in therapeutic riding lessons. They also help with fundraising events, and host their own event once per year where they raise money by selling tickets to their Meet a Mentor Series. During this meeting, they find a successful young rider to talk about how they made it to the top of their sport at such a young age and how they balance life with horses. Therefore, through this program, we are teaching young riders the importance of helping others and giving of their time. We have young riders volunteering from all over South Florida. Learn more about Give a Buck for Equine Therapy Inc.